What is better than playing Holi with colors? 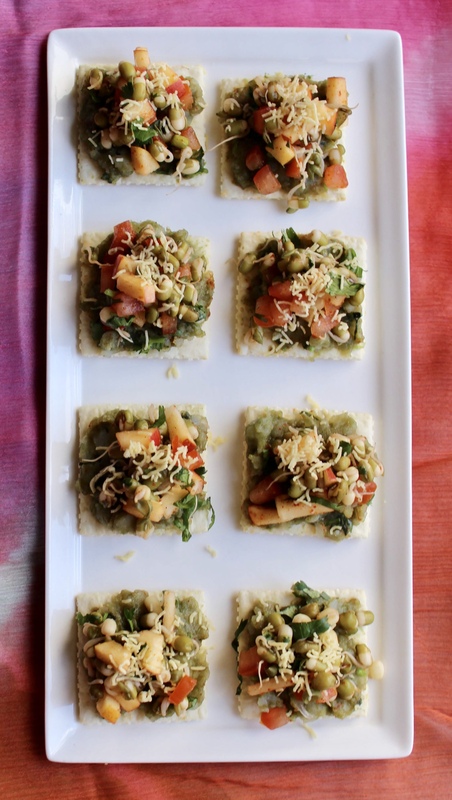 Celebrating Holi with three colorful and delightful chaats! I have got delicious and colorful treats for your eyes and tummies this Holi! These little chat bites are just as delicious as they look. They are quick, easy and super fun to serve for any occasion. 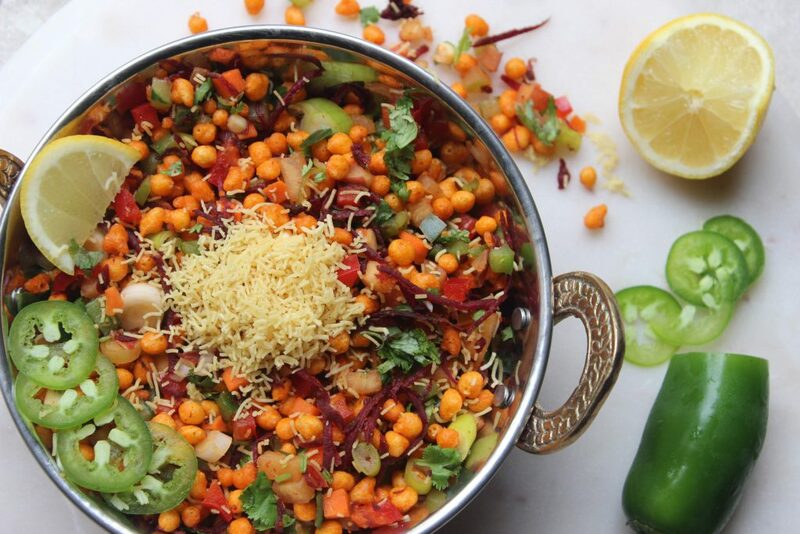 All the chaats come together in under 20 minutes! I hope you all will enjoy these chaats this festive season! Happy Holi! The colorful mung canapes is a tasty bite-size chaat that can be easily served on your favorite cracker. I used saltine crackers because that’s what I had on hand, but it would also taste great on a Ritz cracker or even Wheat Thins. 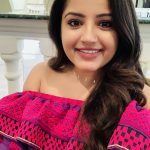 In a bowl, mash the boiled potato, add green chutney to it, ¼ tsp red chili powder, ¼ tsp chaat masala, salt to taste mix well and set aside until ready to use. In a bowl add sprouted mung, diced tomatoes, apple, the reaming red chili powder, chaat masala, lemon juice, and salt mix well. On the cracker spread the potato mixture, and then top it with sprouted mung, top it some sev (if using), and chaat masala. Spicy fried crunchy gram flour puffs. Traditionally it’s eaten with yogurt (dahi boondi). This is a twist on the traditional recipe to make it more versatile. 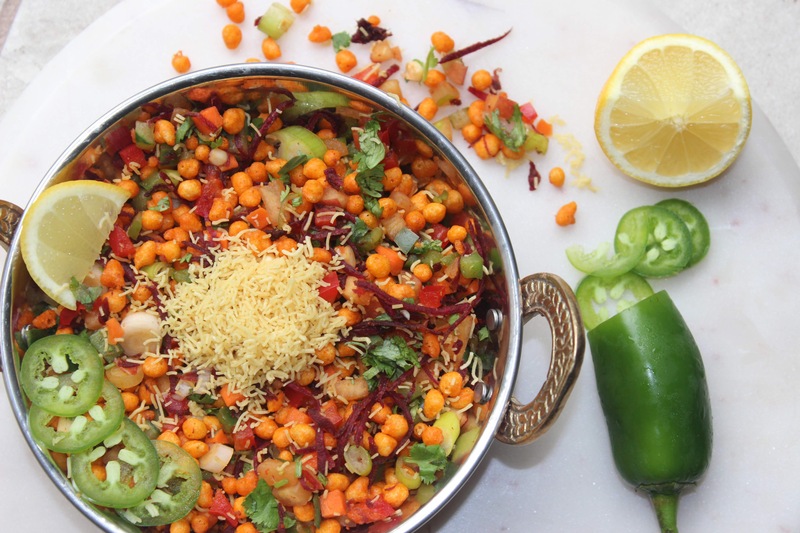 Boondi chaat is very a colorful dish, it’s one of those dishes you eat with your eyes first! I love how easy it is to make and the fact that it doesn’t require me to turn my stove on is just icing on the cake. Also, it’s FILLED with so many yummy veggies and fruits as well. 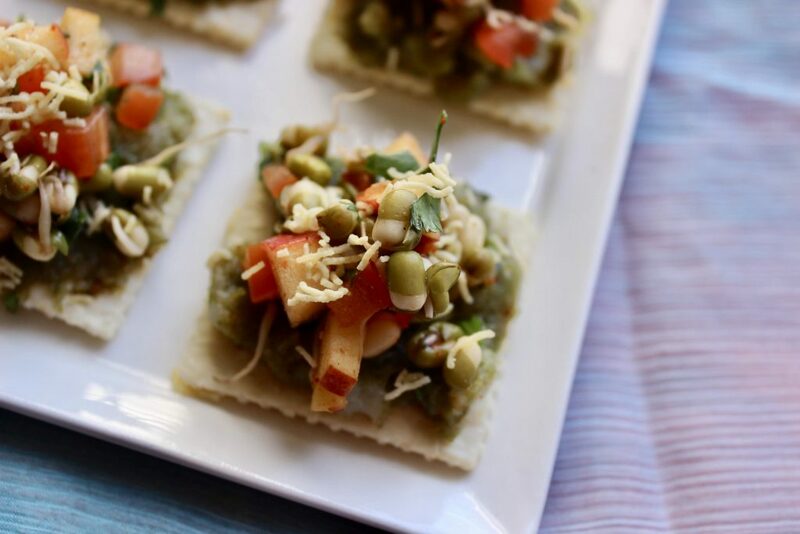 Make this as an appetizer at your next party and impress your guests, be sure to tag me and share how you liked this. As always, stay happy and stay hungry! Mix all the veggies and fruit in a large bowl. Put everything in a cheesecloth and squeeze out all the access liquid. Put the fruit and veggie mixture in a big bowl – add olive oil, chaat masala, red chili powder, and salt if using and mix. Add the pack of the masala boondi when ready to serve. Squeeze the lemon juice, top with the fine sev (if desired), and add cilantro. Give everything one last mix and serve, add extra sev and cilantro (if desired) on top and enjoy! 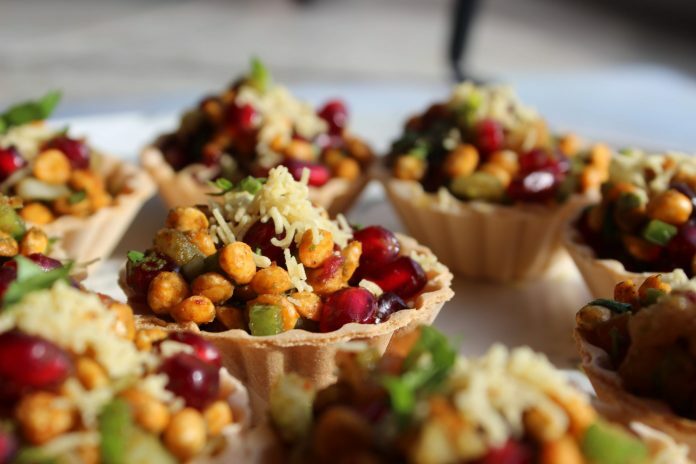 This chaat basket will satisfy all your taste buds, it’s spicy, tangy, and a little sweet. You get the tartness from the pomegranates and it’s crunchy from the chaana dal and the chaat basket. This is an easy appetizer that comes together in just 10 minutes. You can prep everything ahead of time, I would suggest mixing everything right before serving to prevent from getting soggy. 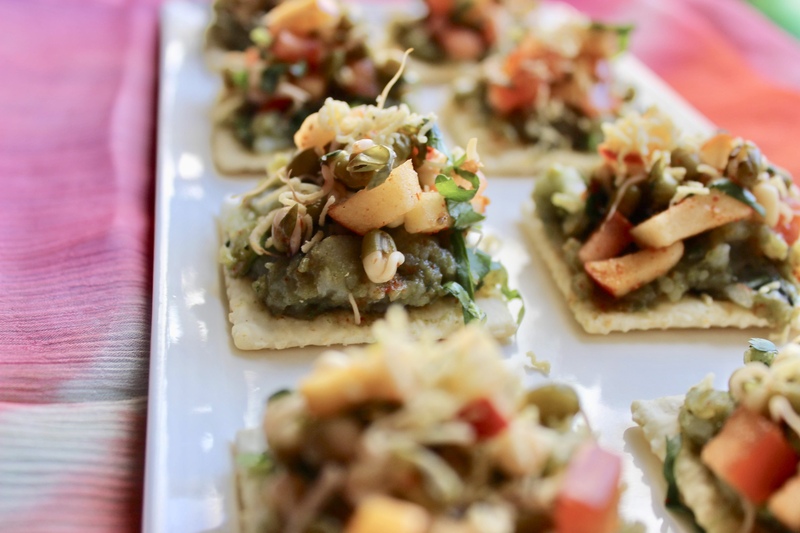 Hope you enjoy this easy yet super fancy looking appetizer. In a bowl, mix pomegranate arils, chaana dal, potato, tomato, jalapeño, green onions, cilantro, red and green chutney, and all the spices. Squeeze a little lime on top (if using) and mix well. 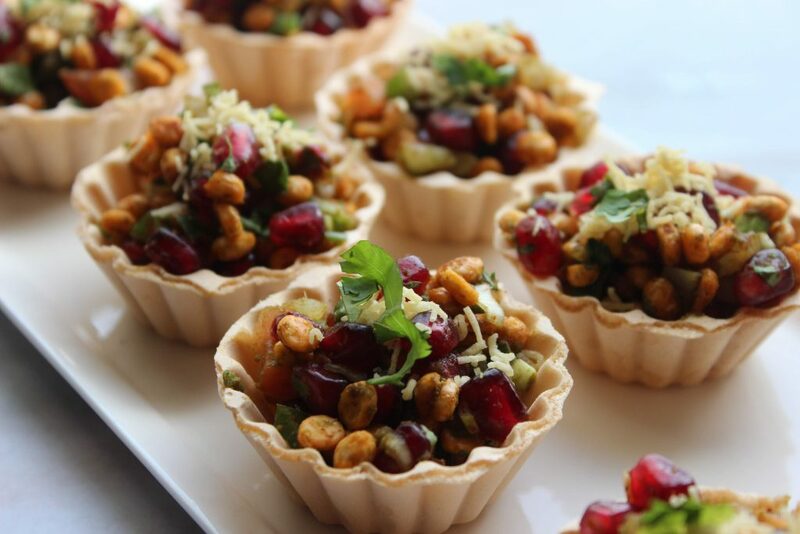 Fill the chaat baskets with the chaat mixture, top it with the fine sev (if using).